Maybe someday Disney will decide to cease their line of direct-to-video sequels to their big-screen flicks, but August 29, 2006 isn’t that day. The release of Brother Bear 2 proves that the studio still wants to milk their franchises for all they’re worth – even those that didn’t do all that well at the box office. 2003’s Brother Bear did okay, but its $85 million failed to light up the charts. I guess that was enough to guarantee a DVD sequel, though, since I have this disc in my hands. Bear 2 picks up not too long after the conclusion of the first flick. We re-encounter human-turned-bear Kenai (voiced by Patrick Dempsey) and his young real-bear charge Koda (Jeremy Suarez). We also run into returning characters such as Tug (Michael Clarke Duncan) and Canadian moose Rutt (Rick Moranis) and Tuke (Dave Thomas). Kenai dreams of his old female pal Nita, someone he knew as a human kid. From there we meet the adult Nita (Mandy Moore) on the verge of an arranged marriage to Atka. However, the locals interpret a severe weather event as an omen, and the nuptials go down the tubes. When Nita consults with local sha(wo)man Innoko (Wanda Sykes), she learns that the spirits have committed her to Kenai. The only way to escape this bond: return to the place where Kenai gave her a special amulet and burn it there. The catch? He needs to go with her. Equipped with a spell that lets her speak bear, Nita tracks down Kenai and convinces him to go along with the plan. The movie follows their renewed relationship and ensuring complications. They face a few threats along with Koda’s jealousy when his buddy cozies up with Nita. I’ll give Bear 2 this: at least it doesn’t just regurgitate the story of the first movie. Many of Disney’s direct-to-video flicks take that path; they just twist the tales of their predecessors but don’t both to do much one could call new. I wouldn’t call the plot of Bear 2 particularly original; yeah, the human/bear romance is unusual, but once we get past that, it’s themes and tale on things is predictable. Nonetheless, I’m glad that the movie manages to avoid a basic retelling of the first flick. That helps make it more interesting. We also get a fairly good voice cast for the sequel. The main negative comes from the new Kenai. Dempsey acts as a bland substitute for Joaquin Phoenix; he fails to create a lively take on the character. Moore is acceptable as Nita, though I don’t think she creates a very interesting personality either. The supporting characters are more interesting. Suarez continues to do fine as Koda, though, and it’s fun to get Thomas and Moranis back again. In addition, SCTV fans will be happy to hear Catherine O’Hara and Andrea Martin as the “moosettes”. Four SCTV actors all together again? That helps make things more special. Truthfully, I find it hard to find aspects of Bear 2 that deserve great praise. However, I also think it’s tough to discover much about the project to criticize. The visuals all look fine, if not quite up to feature film standards. The movie replicates the lush settings of the original flick and manages to create reasonably fluid characters and action. Again, the story is more than serviceable. Sure, it just reworks the usual scenario in which a man and a woman fall in love despite their differences, but it comes across as charming and enjoyable nonetheless. The bear/woman twist adds some spark, but matters usually proceed along predictable paths. While I find it tough to highly endorse Brother Bear 2, I do think it has enough going for it to be enjoyable. The movie doesn’t overstay its welcome and it keeps us entertained across its 73 minutes. This is one of the better Disney made-for-video sequels. 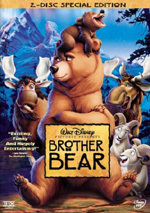 Brother Bear 2 appears in an aspect ratio of approximately 1.78:1 on this single-sided, double-layered DVD; the image has been enhanced for 16X9 televisions. While not flawless, the transfer usually looked solid. Sharpness was pretty positive. A little edge enhancement meant the movie occasionally seemed a bit indistinct, but those examples occurred infrequently. The majority of the flick appeared concise and accurate. Jagged edges and moiré effects created no concerns, and the movie presented absolutely no source defects. Like the first flick, Bear 2 featured natural settings that boasted a vibrant and rich palette, and the DVD demonstrated excellent color reproduction. It mixed a nice variety of hues, all within the natural outdoors setting. From foliage to animals to other elements, the colors were consistently terrific. Black levels seemed similarly distinct and rich, while low-light shots came across as appropriately dense but lacked any issues related to excessive opacity. Although this one wasn’t stellar, the visuals were more than satisfying. Like its predecessor, Brother Bear2 comes with two audio choices. We get both Dolby Digital 5.1 and DTS 5.1 soundtracks. For the most part, the pair sounded very similar. The Dolby mix offered slightly weaker bass response, but overall, the two seemed a lot alike. Although the soundfield moderately emphasized the front domain, it presented a nicely balanced and engaging effort. Some smooth directional dialogue popped up at times, and the score demonstrated clear stereo imaging. Effects appeared in their appropriate places and moved cleanly across the spectrum. The surrounds added solid reinforcement of these elements throughout the film, and they kicked into gear well during louder sequences. The movie’s smattering of action sequences provided some nice discrete audio, with elements that seemed accurately located and dynamic. Audio quality was positive. Speech seemed natural and distinct, and the lines showed no problems related to edginess or intelligibility. The score was lush and vivid, as those portions appeared bright and dynamic throughout the film. Effects came across as accurate and clean. They demonstrated no signs of distortion, and they presented fine bass response as necessary. Low-end was warm and tight overall, and those elements lacked any signs of looseness. The audio of Bear 2 didn’t dazzle, but it mostly seemed satisfying. Only a few minor supplements accompany the film. Behind the Music of Brother Bear 2 runs eight minutes, 20 seconds as it offers movie shots, behind the scenes bits, and interviews. We hear from singer/songwriter Melissa Etheridge, Disney Toon Studios Sr. VP Matt Walker, producer Jim Ballantine, Disney Toon Studios producer Susan Kirch, director Benjamin Gluck, singer Josh Kelley, art director/associate director Mary E. Locatell, score composer Dave Metzger and music supervisor Steven Gizicki. We learn a little about what inspired Etheridge to compose the various tunes and her approach to the material, specifics of various numbers, the collaboration between Etheridge and the filmmakers, and other aspects of the flick’s music. Inevitably, the show offers a lot of praise and happy talk. Nonetheless, we get some decent facts about Etheridge’s work for the film, so the program proves reasonably useful. A game called Trample Off, Eh? lets us spend more time with Rutt and Tuke as they lead us through a trivia quiz. We need to answer these correctly to earn “moose chips”; get enough and the moose can redeem them for good Northern Lights seats to impress the moosettes. If you’ve watched the flick, you’ll not find it difficult to answer these. You get an ending video after the game finishes, and what you see depends on your performance; you’ll get better seats when you answer correctly. Since the game comes with voice-over from Rick Moranis and Dave Thomas, it offers more fun than most in its genre. As the disc starts, we encounter a mix of ads. We find trailers for The Little Mermaid, The Wild, The Fox and the Hound 2 and Airbuddies. These also appear in the disc’s Sneak Peeks domain along with promos for Cars, Twitches, Cinderella III, Mickey Mouse Clubhouse, Toontown Online and Enchanted Tales. Should you expect a classic Disney adventure from Brother Bear 2? No, but you can anticipate a reasonably fun tale. It manages to stand on its own and not just rework the original movie, and it brings out some decent entertainment. The DVD offers very good picture and audio but suffers from a lack of substantial extras. 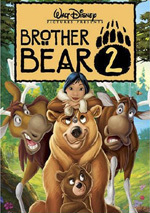 Fans of Brother Bear should enjoy this pleasant sequel.